Last week we purchased a trailer to tow behind our SUV. Todd had considered switching our sedan for a truck but our garage doesn't have the room to hold two large vehicles and all of the other things we keep in it. 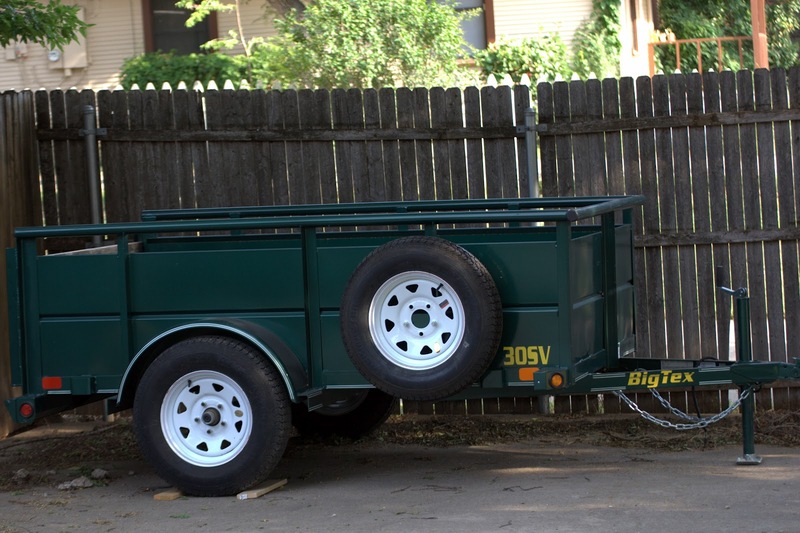 The trailer is a more convenient and less expensive route as it allows us to have all of the seating of our SUV and the storage of a truck bed. We decided to take it for a test run on Memorial Day weekend. 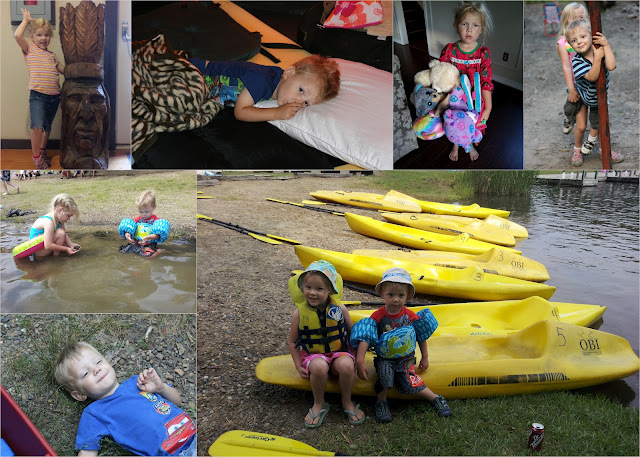 We went tent camping to Beaver's Bend, OK and used the trailer to tow all our our camping gear. It did great. We are so happy to have gotten it. 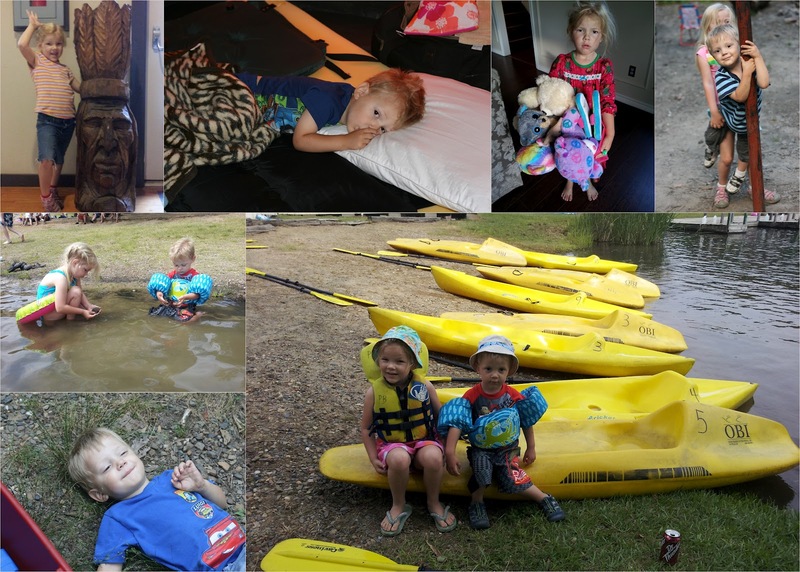 The camping trip was fun for the kids. I enjoyed it except for the bugs. I am still recovering from chigger and mosquito bites as well as a red ant bite on my foot. Todd had seven ticks. Carson, who laid on the ground, played with the dirt, ran through the high grass only had one. How is that possible? Emilia had two ticks. She first showed us one on her chest. Once we got it out without any pain she decided to tell us she had one on her belly button. That one was much trickier to remove. Emilia was really excited about the trip. On Friday morning she came down the stairs in her Pj's ready to go. She had with her four stuffed animals and a pair of fluffy slippers. Her face fell when I told her that she couldn't take all of those toys with her to camp. (I couldn't resist taking a picture of her with my phone.) We settled on two animals. I had to run them through the wash when I got home because they were so filthy. It seemed I was going to have my wish granted but in the end we shared a site with a family who was leaving early the next morning. 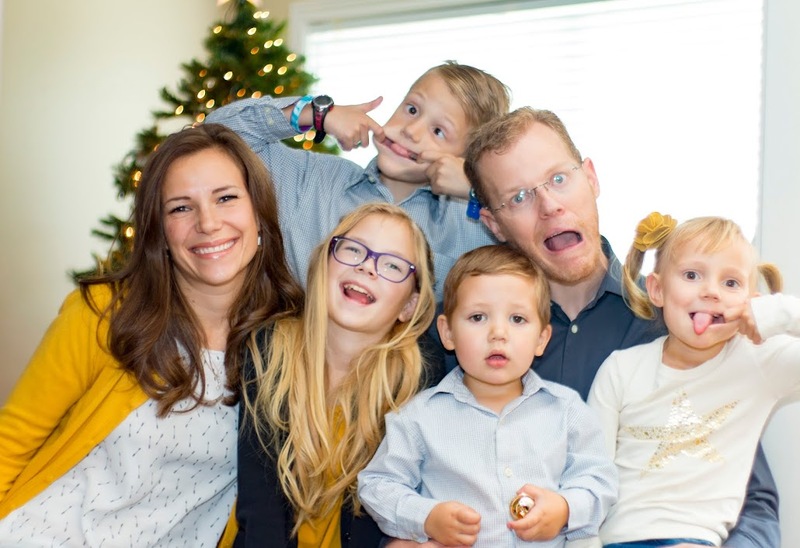 They were great people and they had two children the same age and gender as Carson and Emilia which made my kids very happy. 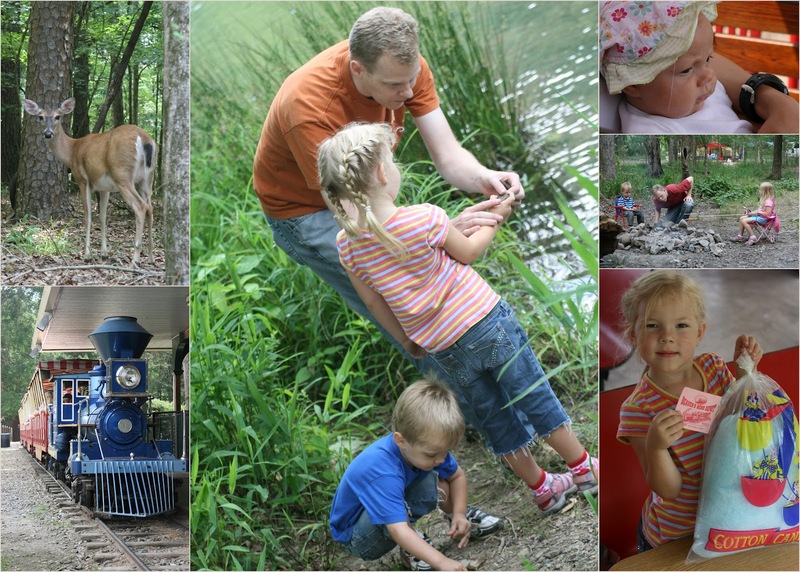 On Saturday we swam in the freezing river, skipped rocks, rode on a canoe and rode on a miniature train around the park. We even saw some deer while on the train and on several other occasions afterwards. In fact we made it a game to spot deer while driving around camp. At the end of the train ride the locomotive engineer announced that the person holding ticket number 401 had just won a bag of cotton candy. We were the winners! 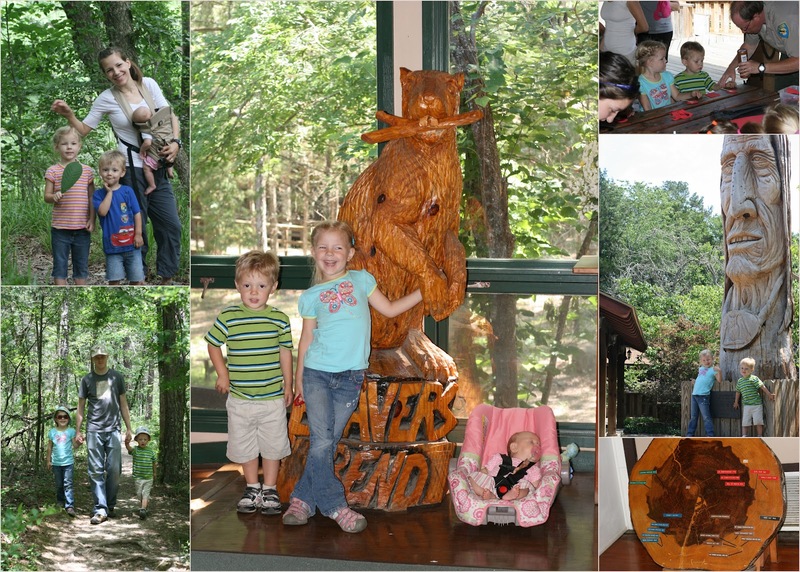 On Sunday﻿ we took the kids to the Nature Center where they got to do a craft with the ranger and observe all of the cool wood carvings that had been made locally. We had a picnic in the amphitheater and afterwards went on a nature walk along the river. The Nature Center had a large tree trunk resting on its side so that we could see all of the rings that marked each growth stage. Towards the center there was a label that showed the tree size in 1776. As it moved outward, there were other labels indicating important historical events such as the signing of the US Constitution, the Bill of Rights, the Civil War and finally World War I. The tree was cut in 1965. It was impressive to see how much had transpired during the life of this one tree. If trees could just talk, I wonder what they would tell us. The kids favorite part was playing at camp. They loved collecting and throwing rocks, going on wagon rides and of course cooking by the fire. They made terrific hot dogs and s'mores. We had originally planned to stay through Monday, but after sharing a tent with the kids for two nights in a row, we decided to leave on Sunday instead. Carson was full of energy each night (too much chocolate and marshmallows) and loved to jump between our inflatable mattress and the foam pad on the other end of the tent. The first night we couldn't get him to sleep until after midnight. Saturday night was much better. He fell asleep by 10 pm. The truth is that I was happy to leave a little early. I couldn't stand having to deal with any more bug bites on me. Plus, we had to clean up camp every time we left because animals were coming into our site and going through our trash. It was a lot of work to prepare for it, live it, and clean up after it, but in the end the kids loved it and I enjoyed getting away from my daily responsibilities.